I’m not going to sit here and argue with you about desktops being better than laptops and vice versa. Ultimately YES, desktops are more powerful, and outperform laptops. Now, obviously laptops are more portable than desktops. That is their natures, and why they were named what they are named. 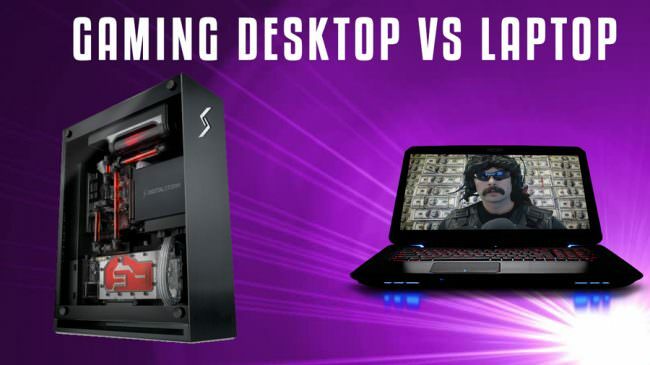 So I am here to tell you, that you need to stop comparing Gaming Desktops to Gaming Laptops. EVERY article on the internet will tell you that Desktop performance per dollar outweighs that of a Gaming Laptop purchase. If you need to game on the go because you are always moving around constantly for work or travelling. Then a gaming laptop will be way better than lugging around a Desktop computer. Although to an extent you can purchase a desktop that you can travel around with, but it will have more parts than a gaming laptop. Those smaller desktops are called Small form factor desktops which you can read more about here. Now, if you have a work space, and no need to game on the go the no-brainer is to purchase a gaming desktop. I Believe they are totally fine to purchase. Yes, they do have lackluster parts most of the time, but if you are a noob then it should suffice. You may be made fun of online because of other big headed users thinking they are superior because they built theirs. To an extent maybe they are, but I might have bias because I love to build them myself. Either way don’t worry about it you are here to game. This means to build yourself a computer with parts and save hundreds of dollars. This is usually for enthusiast who love customization. I personally don’t think it is that difficult to build your own. This is because the resources are abundant online, from YouTube, to the mass amount of forums, and of course Reddit. I bought my first DIY computer from NewEgg as a bundle and saved so much money which you can check out here. This is their combo section and they bundle a set together for you and you don’t get the option on choosing custom parts, which is never a problem when you save a lot of money anyways. Speaking of saving money you can check out our article on a bare minimum gaming build that is only $400. Gaming laptops I will get less into because from here you are just choosing the best laptop that money can buy that is gaming specific. Here you’re going to choose from price, looks, newest hardware, and brand loyalty. The most important thing is the hardware, so do your research, or buy the most expensive thing on Amazon or Newegg. While trying to get the best deal. Hardware and functions will vary from brand to brand so if you need a bunch of USB ports pick brand A, if you don’t then pick brand B ect. Always buy a desktop when portability is not needed. Money can be saved, customization and upgradability are greater. You will just love owning a power desktop more in the long run. If this rule ever changes where Laptops become more cost effective and more powerful than desktops, I will change this article. Although I do not see that happening in the next ten years, but who know I could be wrong. If you liked this article then you can check out the rest of our PC hardware talk here.